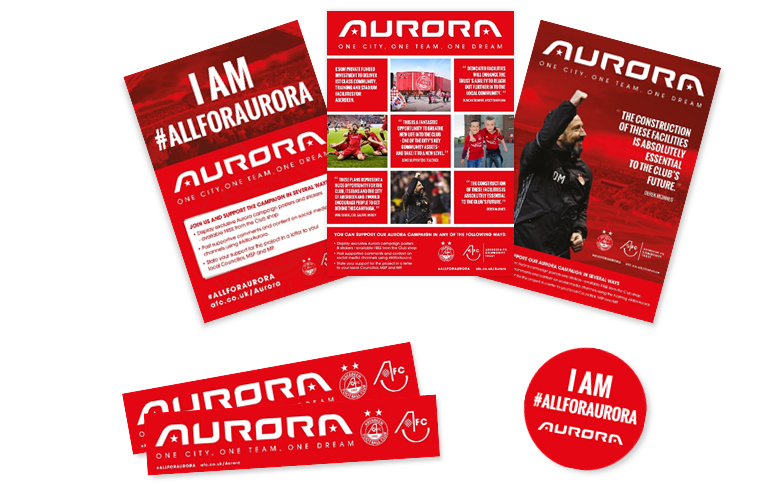 You can demonstrate your backing by displaying the Aurora branded material, such as posters and stickers, posting supporting comments on social media using the hashtag #AllForAurora and providing public endorsements. Collect a supporter pack from the AFC Club Shop. You can make your voice heard, the best way to do that is to contact your local Councillor, MSP or MP. Your views do count and it is important that you let your Councillors know you support the plans and reasons why. I am writing in support of AFC’s plans for much needed and exciting facilities and stadium at Kingsford which will underpin the Club’s ambitions both on and off the pitch in the long term. 2. Highlight the reasons you support the plans, e.g. The proposed training, community and stadium facilities at Kingsford represent a £50m private sector investment in the region at a time when our economy is struggling. It will bring confidence and economic benefit to the region, including the creation of new jobs. AFC urgently needs significantly improved training facilities and a modern stadium. These are integral to the long-term success and sustainability of our team which has a positive impact on the city’s economy and social well-being. The creation of suitable AFC Community Trust facilities is vital to extend the reach of the charity which provides much-needed support to a wide range of communities and people across the region and is improving overall health, well-being, social inclusion and participation for many who would otherwise be excluded due to lack of facilities and programme delivery. The Kingsford site is ideally situated as it is less than 6 miles from the city centre and the AWPR will provide excellent accessibility for both home and away fans coming from areas to the North, South and West. It will also link the site up with a number of park and ride facilities across the city ensuring ease of access to the stadium and community facilities for most of our user groups. Recent research of football fans transportation methods carried out independently by AFC Supporters Group revealed that the majority come from the North and West of the region. Aberdeen only needs one stadium and training facilities, so the proposal is not going to set a precedent for further, similar development in the area. Westhill and Kingswells residents have little to fear. With only around 25 matches per year, there is not going to be a major or frequent impact on their day to day lives. The Club has been trying to find a new home for 18 years now and, having explored all potential site options in the city, has identified that Kingswells is the only remaining option. AFC cannot afford to miss this opportunity. Having co-located facilities, across one site, demonstrates the Club’s vision and ambition which will help them compete against other UK and European Clubs. The Club will benefit from the best facilities and from economies of scale. The region will benefit from a unique, major sporting campus and the addition of community facilities. I would urge you, as my Councillor, to make the right decision for the Club, the city and the wider region. AFC’s AURORA campaign has demonstrate the huge level of support across Aberdeen for these proposals. An independent petition already has more than 8,000 signatures and is growing daily. I would hope that, as my elected representative, you will be taking this over-whelming support into account when making your decision. 4. Be persuasive but polite! Our elected representatives are much more likely to be convinced by respectful and sensible arguments. The Club does not condone intimidation, abuse or any forms of disrespectful behaviour. Indeed, any such behaviour will be detrimental to our plans.